Whey protein has the highest biological value, over 100, compared to any source of dietary protein. This means that in a gram-to-gram comparison, the body absorbs and retains this protein better. When properly manufactured, whey protein is lactose-free, has a very low glycemic index, low calories, carbohydrate-free and sports a high concentration of basic amino acids and a higher concentration of BCAA's than any other protein source. NITROTECH WHEY GOLD is a technologically advanced whey protein supplement that combines the high quality of whey with the ideal absorption-digestion due to the micro-filtration process that creates a high-quality protein extract. NITROTECH WHEY GOLD contains very few carbohydrates and fats and can help you achieve your goals in increasing muscle mass, strength and, of course, reducing body fat in the shortest possible time. The novelty in the processing and preparation of the new NITROTECH WHEY GOLD is that it has not been manufactured using high temperature techniques and, as a result, most of the unique characteristics of whey protein remain unchanged. 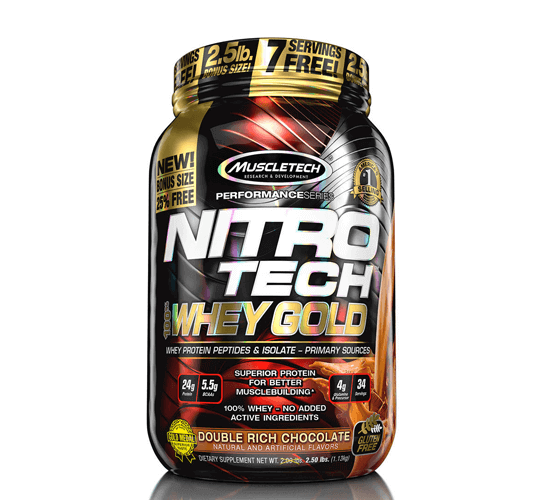 Each dose of NITROTECH WHEY GOLD provides 24g of high biological value protein and just 2g of carbohydrates. It is made from the best sources of whey protein and contains the most ideal amounts of essential and non-essential amino acids plus 5.5g of BCAA's and 4g of glutamine per dose! It combines easily with water, juice, milk, yogurt and you can add it in your breakfast cereals as it literally dissolves everywhere! The taste of NITROTECH WHEY GOLD is delicious but even more delicious are the results it brings to lean muscle growth and enhanced sporting performance.